What's a Gutter Screen and Do I Need One? While there are multiple types, the purpose of a gutter screen (or guard) is to reduce the amount of solid material in your house gutters. The need for them, however, is not so easy to answer. The primary selling point of gutter screens is that you then do not have to clean your gutters. This is FALSE. The only way to keep solids out of your gutters is to cover them completely – but then water cannot get in either and you need your gutters to move water away from your home. A screen will reduce how frequently your gutters need cleaning, but they – and the screens themselves – will collect solids that need removing. 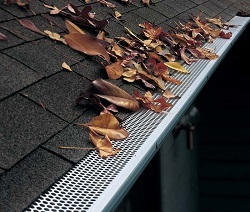 By reducing the amount of debris entering your gutters, you do increase their life span and their ability to protect your home from water damage. Fewer clogs in your downspouts also prevents standing water – a breeding ground for insects. Screens will prevent birds and rodents from nesting in your gutters. They can improve the value of your home. The realities of gutter screens are not always ideal. They can be expensive. The cost of installation is directly proportional to the length of screen installed. Screens are imperfect. Damage to screens is possible and can be difficult to spot. Screens do require cleaning and maintenance. In the Bay Area, the value of a gutter screen really depends on how much debris your gutters collect or how many animals like to nest there. If you do not have many overhanging trees, the cost of installation is not justified. However, if your gutters overflow multiple times a year, then screens are worth considering. If you are considering screens, it is best to have a licensed installer come out to inspect your gutters and determine how much value they will offer to your specific situation.